Background. Construction and Steady-State Operation of Induction Motors. Uncontrolled Induction Motor Drives. Power Electronic Converters for Induction Motor Drives. Scalar Control Methods. Dynamic Model of the Induction Motor. Field Orientation. Direct Torque and Flux Control. Speed and Position Control. Sensorless Drives. Literature. Glossary of Symbols. Index. 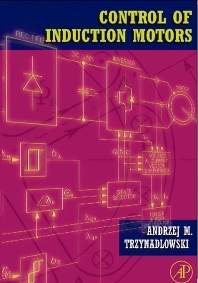 This book is a comprehensive reference source for practicing engineers and students specializing in electric power engineering and industrial electronics. It will illustrate the state of the art in induction motors. Beginning with characteristics and basic dynamic models of induction motors, and progressing to low- and high- performance drive systems. The book will be rich in useful information, without an excessive mathematical burden. Computer simulations resulting in mock oscillograms of physical quantities are used for illustration of basic control concepts. The content of this book is divided into three basic parts: 1) control-oriented description of induction motors, 2) control methods, and systems, 3) control means. An induction motor is presented as an electromechanical power converter, and basic relations between the electrical, magnetic and mechanical quantities in the motor will be explained. Control methods and systems will be classified according to the controlled variables(torque, speed, flux), actuating variables(voltage, current), and dynamic performance (uncontrolled, low-performance, and high-performance). An overview of power electronic converters and information processing equipment used in the modern induction motor drives is included. Such systematic approach will give the readers a comprehensive overview of the field of induction motor control. Electrical, mechanical, and industrial engineers in industry dealing with electric motors and power electronics which provide power and drive for a wide array of equipment, machines, and manufacturing equipment. Andrzej Trzynadlowski is a Professor of Electrical Engineering at the University of Nevada, Reno. He is a senior member of the IEEE and a member of the Industrial Drives and Industrial Power Converters Committee of the IEEE Industrial Applications Society. He is the author of over 80 publications in the areas of power electronics and electric drive systems and has been granted 11 patents. University of Nevada, Reno, U.S.A.